You are currently browsing the tag archive for the ‘hay cubes’ tag. Last Saturday Countess Chickadee celebrated her thirty-first birthday. It was a wild party with hay cubes for all. Well, for all who showed up at the fence! And Miss P. of course. I suppose that statement could still come true, but as far as the “old girl” is concerned, she had a good winter. One could even say a great winter. She’s come out of it looking really good and ready for the green grass that’s sprouting up all over the pasture. Chickadee had literally been put out to pasture. 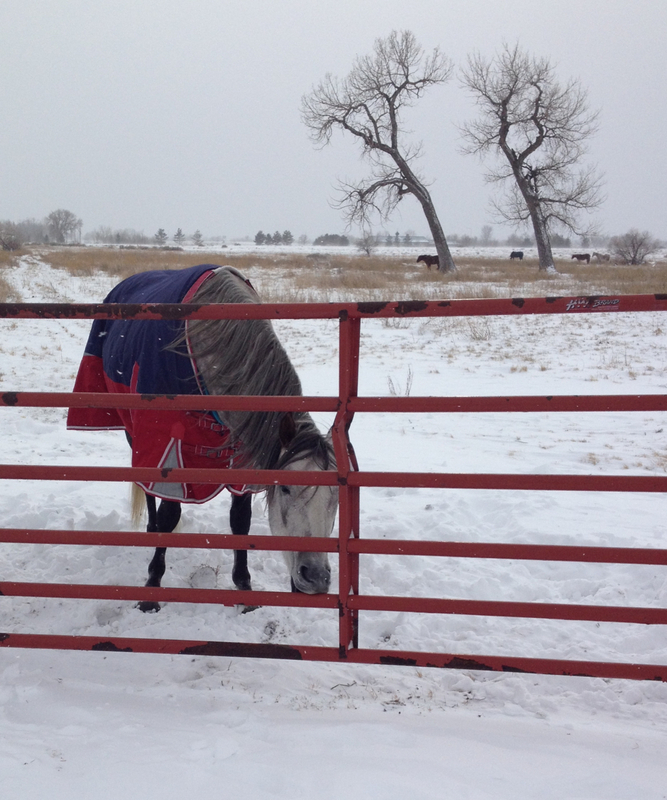 Amazing how well she did with daily grain and a blanket to protect her on the cold days. I think what I’m trying to say is how all of us–animal and human thrive with attention. When someone loves us, cares for us, notices us, we do well. Psychologists have studied this forever always with the same end result. We need to be loved. It’s hard wired into us. Know this old girl: You will live out your years being pampered and loved. And who could ask for a better birthday present? Tuesday I promised you an explanation as to why I didn’t post anything last week. Maybe this photo helps shed some light. Wonderful visitors, one of whom is jam-packed with energy. Tons of it! So much energy I wish I could get a transfusion of even just a little. 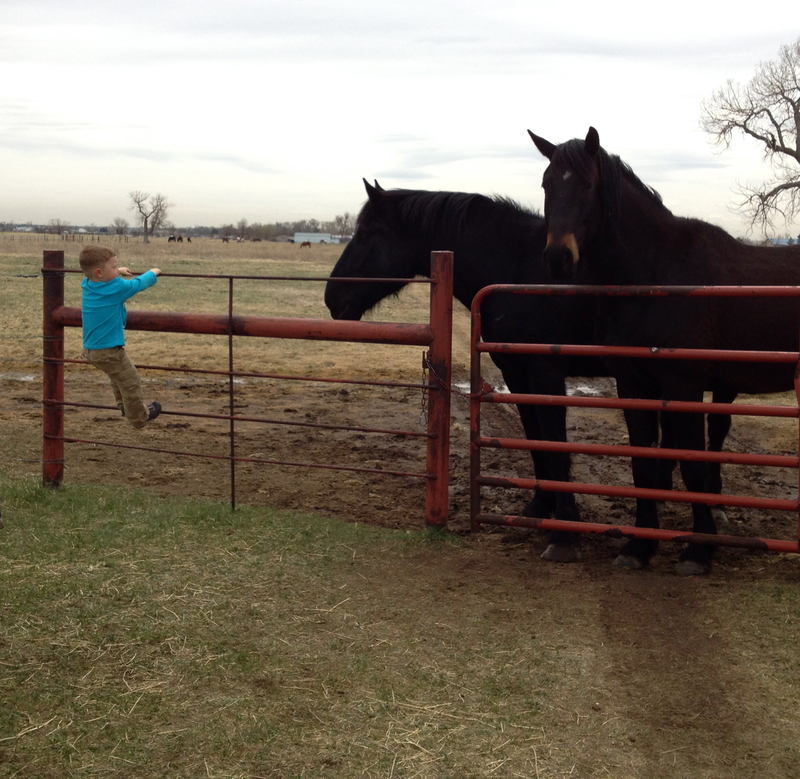 We did manage some visits to the pasture to check in with the horses. They love the little boy with the bucket of hay cubes! Somehow we managed to completely empty the bucket each time! Imagine that! Happy horses. Happy boy. What could be better? Is There a Treat for Me? As the cold weather continues, the regulars show up when I feed the Golden Girls. It seems the horses know my routine better that I do! Truthfully they show up no matter what the weather. I’m just a little more gullible when it’s cold! Some of you may be wondering how I could be any more gullible. You’d be justified! Gullible could be my middle name, though I prefer to think I’m more kind than gullible. 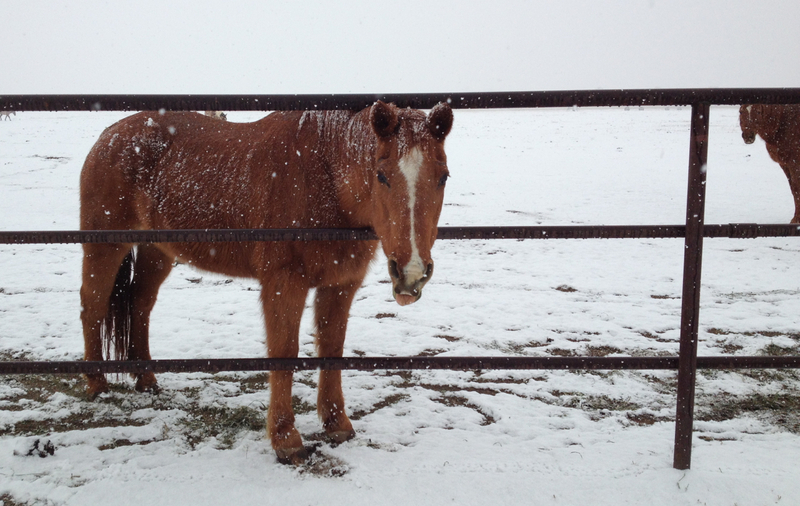 If you’re a horse and part of “our herd” there’s likely a hay cube or two in your future. This is Sunny and Forty. They are cold and looking for a snack. And who did they find, but me! The temperature has dropped to below zero and as you can see from the frosty noses, it’s plenty cold for the horses. If an alfalfa cube or two or three helps, I’m happy to oblige. At least that’s what’s branded on his neck. 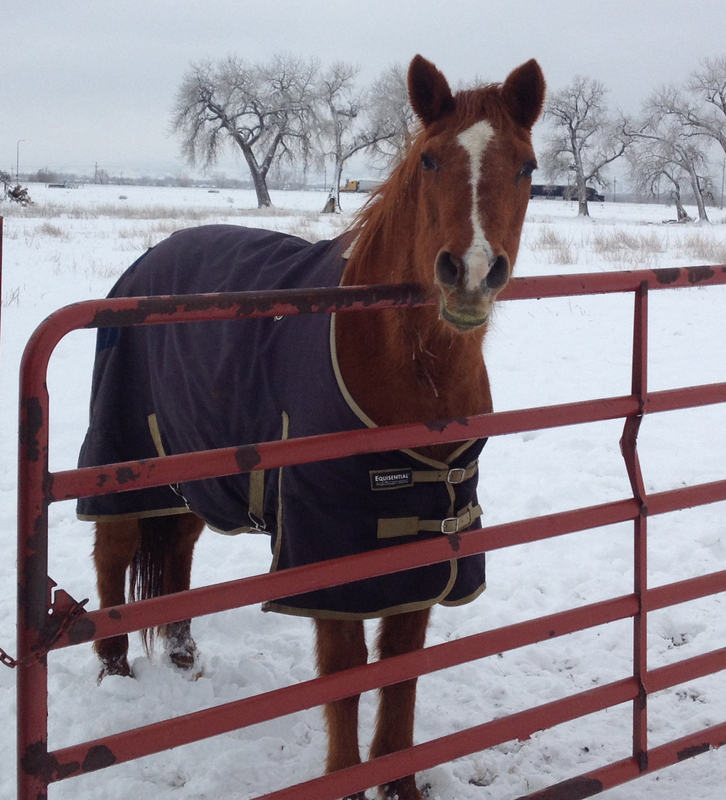 He only drops by occasionally to say hello, get his head scratched and of course to nibble a hay cube. And then maybe another five or six! 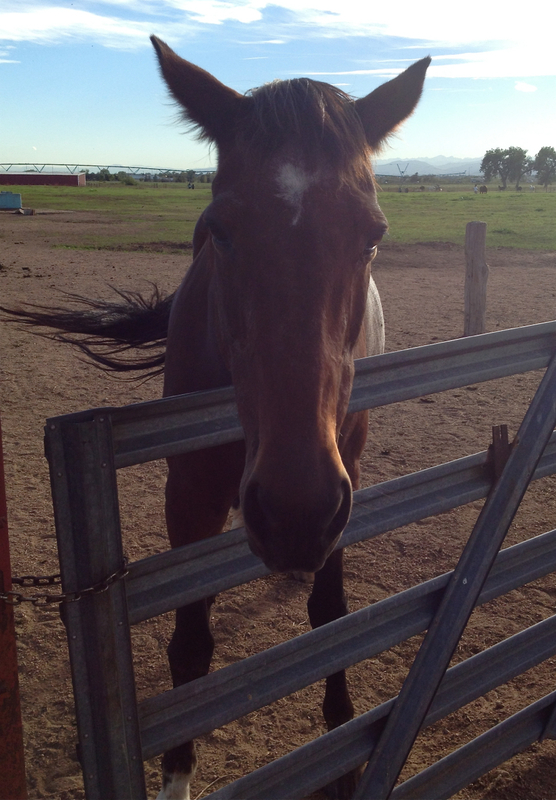 He’s a nice horse. Friendly, mannerly, and really, just a sweetie. I’m told there are ten senior citizen horses in the pasture right now. It’s no surprise that as we age, our animals follow right along beside us. I don’t know about you, but I find it inspiring and somewhat comforting. I like sharing space with these wise, old, sweet things. And I’m sure they’ve passed the word among them to be on the lookout for the Snack Lady. I’m good with that too! My son suggested making a photo book of the oldsters in the pasture. I’m thinking it could be fun. 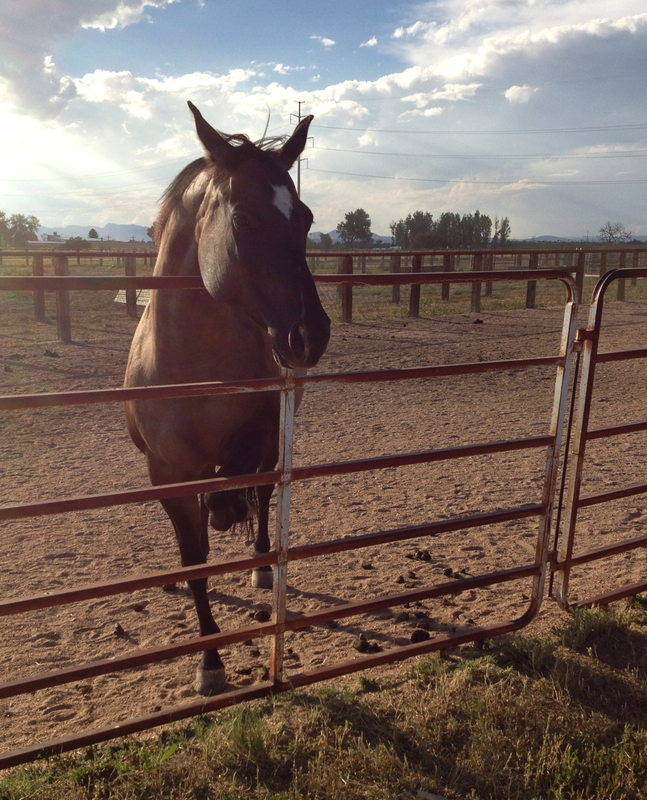 There’s a cute little mare who sometimes hangs out in the turnout paddock by the gate where we feed the Golden Girls. And she knows how to do tricks. When she sees me, she will demurely lift a bent leg. Of course I fall for it every time. Bought the T-shirt years ago. Doing tricks for food is beneath her, she thinks. Ah, the folly of youth! 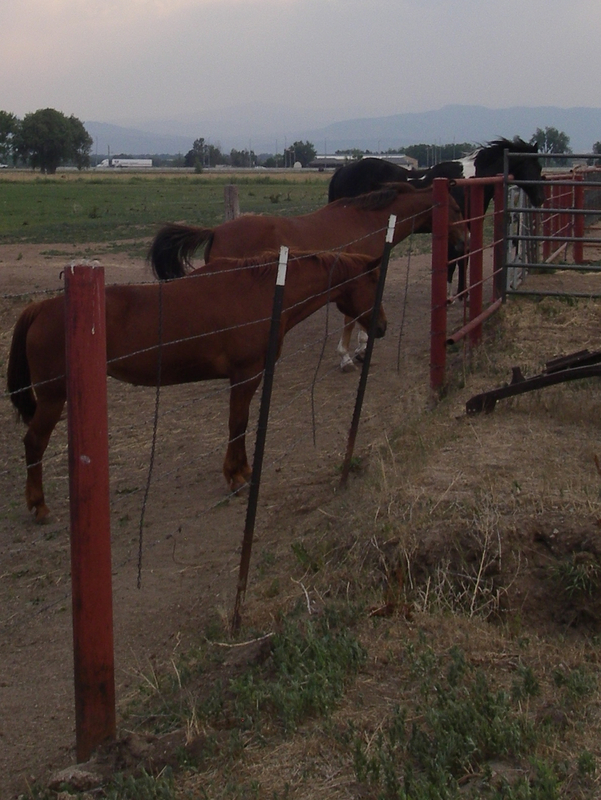 There’s always a bit of a dance along the fence line when I hand out snacks. Even in the Herd of Oldsters, possibly the mellowest, most accepting herd on the planet, there is protocol to follow. Amigo is the most dominant of the bunch and thinks it’s his right to be fed first. Chickadee is a shy girl and almost always brings up the rear. Eventually I think Atty will challenge Amigo for dominance, but for now he yields. Most curious interlopers are chased off. They are told in no uncertain terms that this is NOT their chow line. It’s probably a good thing because I’d end up feeding the entire herd. Which would mean I’d have to find another job or a serious sugar daddy to finance my need to feed every horse I meet! Before the big rain came and filled the pond, I took this photo of the three stretched out along the fence, waiting ever so patiently for their next hay cube. Left to right: Chickadee, Amigo and Atticus. P.S. Just joking about the sugar daddy. Really. It was time for checkups for Bud and Pepper. 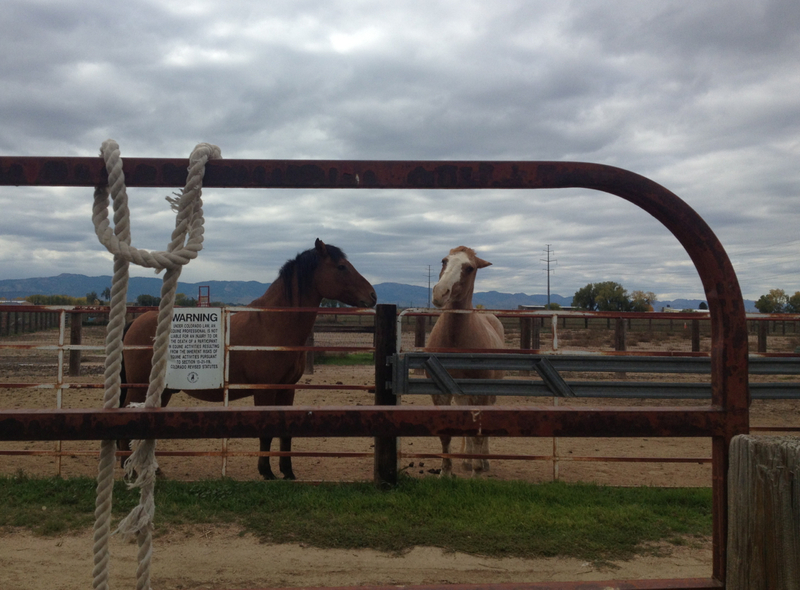 Shots, worming and an overall look-see at their condition. Go to the pasture ahead of the appointment time by at least thirty minutes. Pull our two sweeties out and give them their daily grain. Understandably, large animal vets aren’t ever able to nail appointment times exactly. Large animal vets drive all over the county to treat their patients. And frequently things come up. Things that take a whole lot more time than originally thought. But Bud and Pepper – not so much. They don’t operate in the world of human time. So once they finish their grain and have a few hay cubes for dessert, they’re ready to head back to the pasture and their pals. That’s when we have to get creative. We slip on halters and tie them to the fence. And then, because we are who we are, we offer a little treat. A flake of fresh hay. 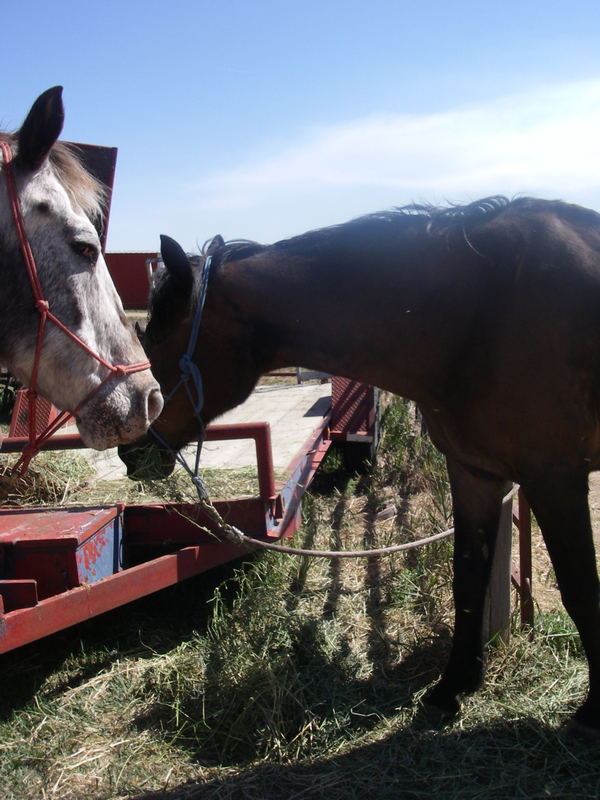 And they don’t have to share it with any other horses. You can see from the photo that Pepper was thrilled and tucked right into it. Bud, on the other hand, was a bit wary. I think Bud’s vet warning system is highly tuned. He’s had more, shall we say, intimate interactions with our vet. Having someone cut on your private parts can make a guy cautious. Then there was the bad reaction he had to shots last year. Yeah, he’s wary for good reason. But this round was uneventful. 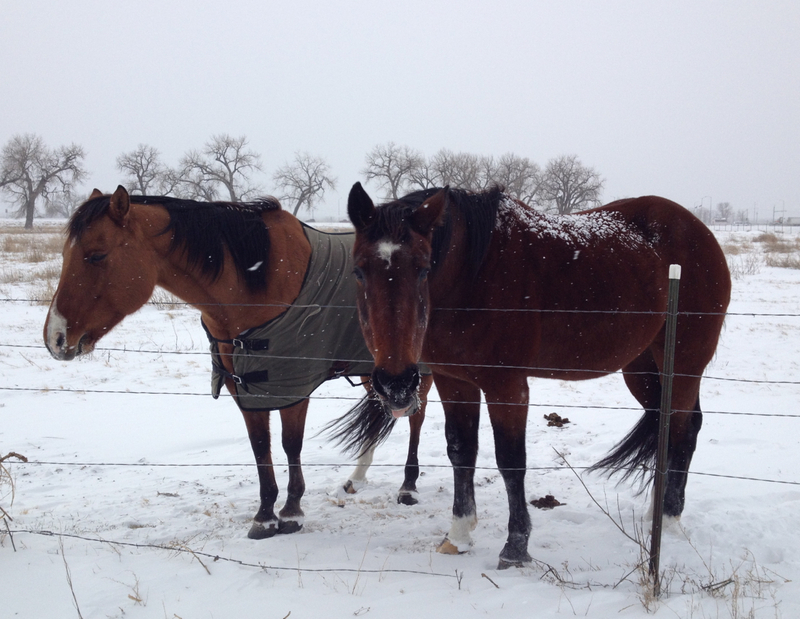 The best news was that in the vet’s estimation, both horses look darned good given their ages and the rough winter.